Countless couples dream of the beauty and intimacy that is offered by a beach wedding. After all, nothing spells romance quite like the bright blue skies, crystal clear waters and pristine beaches offered at Secrets Resorts & Spas throughout Mexico and the Caribbean. A beach wedding, however, can be so much more than just an intimate experience for the bride and groom—there are countless ways to have fun and bring friends and family together before and after you say “I do!” Whether you and your guests are looking for adventure, Unlimited-Luxury®, culture, or relaxation, Secrets Resorts & Spas has you covered! 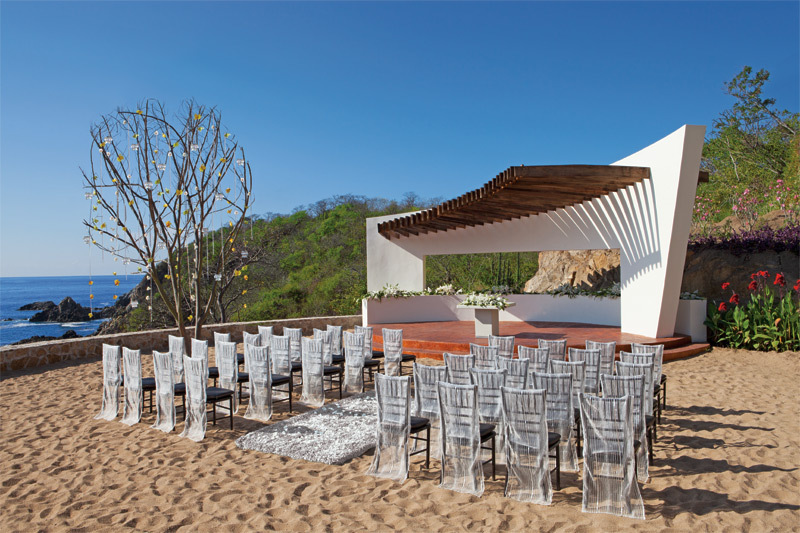 Couples can tie the knot on the golden sand beach under a modern gazebo at Secrets Huatulco Resort & Spa. Get out on the water. – At Secrets Resorts & Spas, there’s much more to do on the beach than just soak up the sun! If your wedding crowd is feeling adventurous, plan a fun-filled couple of hours out on the water. All our destinations offer a variety of ocean activities such as snorkeling, scuba diving, deep-sea fishing, windsurfing, sailing and kayaking, among others! Have a blast on dry land. – If there are land lubbers in your group, check out the many on and off-site activities available at our destinations! The athletically-inclined may be interested in a game of beach volleyball, football, or soccer. 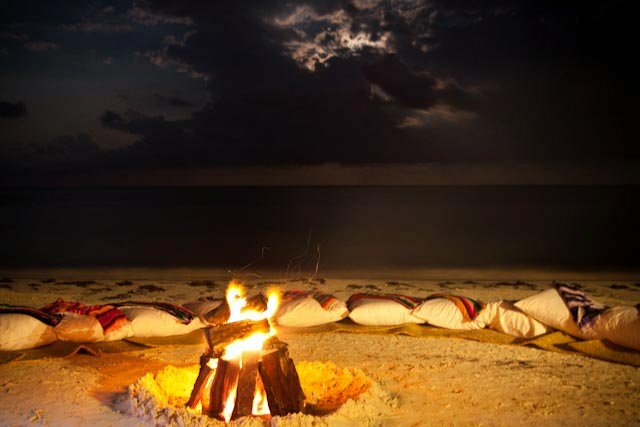 Those looking for a more relaxing time can choose from yoga, Pilates, tai-chi, archery, or plan a bonfire right on the beach. Talk to your wedding coordinator about planning a bonfire on the beach for you and your guests. Relax and get pampered. – If your friends and family are looking more for relaxation than adventure, start with the spa! At Secrets Spas by Pevonia, we pride ourselves on providing a luxury experience and our World-Class spas are no exception! What better way to prep for your big day than a few hours of complete indulgence and serenity? Treat your guests to rejuvenating body and facial treatments, a variety of massage techniques, body wraps and much, much more! 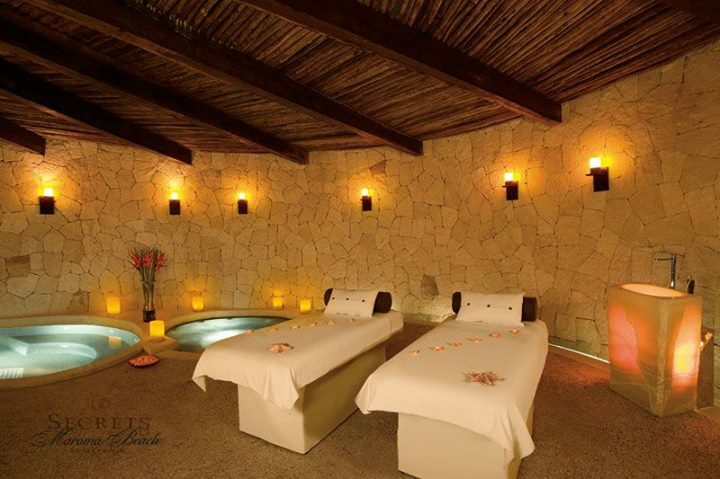 The spa at Secrets Maroma Beach offers everything from salon services to couples massages. Learn a new skill. – Looking to take more home with you than just a tan? Our resorts offer a variety of fun, hands-on learning activities for family and friends to enjoy together. Depending on the destination, cooking, dance, photography, Spanish and wine-pairing lessons are available. Check out the nighttime entertainment. – At Secrets, the fun doesn’t stop when the sun goes down! With nightly entertainment, you and your wedding guests won’t ever experience a dull moment. Performances include live theater, music, dancing and comedy. If you’re feeling lucky, some destinations even include an on-site casino! The entertainment at Secrets The Vine Cancun lights up the night! These are only a handful of the countless activities available at Secrets Resorts & Spas, where there is truly something for everyone! With so much to do and see, a Secrets wedding is guaranteed to be an unforgettable experience for all. Contact your wedding coordinator today to start planning! This entry was posted in Secrets Resorts & Spas and tagged Activities, destination wedding, guest activities, weddings. Bookmark the permalink.